Once the new plants have roots enough to grow on their own you can start a new bed. I take you mean once the runners root. But I need to thin the plants that are already there. This is my third year with this bed, so my original 24 plants have filled in the 5 x 18 foot bed. I need to thin the plants that are there now, not counting the new runners that will be coming out this year. Just wondered if I could do that now since I'm done picking for this year, or will I have to wait till fall. The circles aren't really there, they are just part of Google earth. If you hold the mouse over them you can move up and down, left and right, closer or farther away. Well you can on Google earth but not on my picture. A couple years ago I bought one of those metal frame and canvas shelters. It was 10 x 20 and about 9 feet tall in the middle. Well over time the good old Nebraska wind took care of the canvas covering, and part of the frame, so I took it down. I still had the metal frame, and as you can see by the large pile of 2x6s near the chicken pen I had plenty of used wood. The 2x6s are cedar and came from a deck that was being replaced. I ended up with 195 cedar 2x6s up to 20' long. I put some 4x4s in the ground 30" deep, and left them out of the ground 6". These are on the 13 foot side. I then put a 2x6 on the outside of the 4x4s and another on top. I now had a solid ledge 6" tall to sit the metal frame on, and I lag screwed it to the 2x6s. I then put 2x6s on the sides, spaced about 24" apart, and did the same thing on the top. So basically I had the old metal frame, reinforced with 2x6s running the 13' length on the sides and top. I then put vertical siding on the sides and OSB on the top, securing it to the 2x6s. I closed in both ends, added a door and a window, plus an opening for the chickens to get out to their pen. A friend gave me some shingles he had left over from a job, added a little paint, and I had a chicken house/storage shed. Only down side was the metal framework gave me a 6/12 pitch so it was a little tough staying up there while putting on shingles. Fortunately the guy that gave me the shingles had some brackets to hook in so I could use a 2x6 to keep me up there while working. Helps to have a friend that is a contractor. Got a surprise today, found a couple small white eggs in the chicken house. Now they aren't much bigger then a pigeon egg, but it's a start and I thought early. I got the Leghorns on 3/23 and the Rhode Island Reds on 3/30. That means a first egg in less then 4 months. I thought it would take 5 to 6. What a great thread. Your resourcefulness is inspiring! 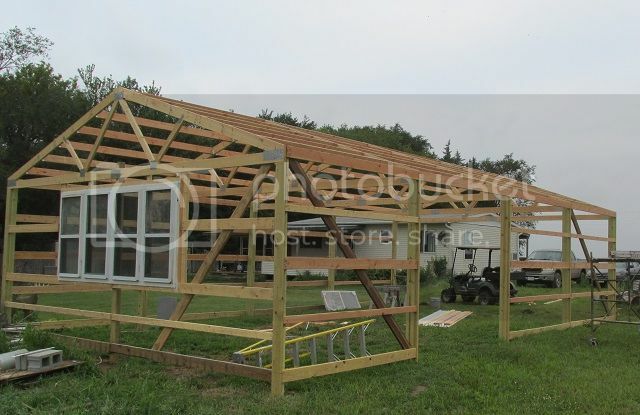 Would you mind sharing your plans for eventually building a garage? Our new place doesn't have one and my husband is going to build one, and we are looking for ways to do it inexpensively. 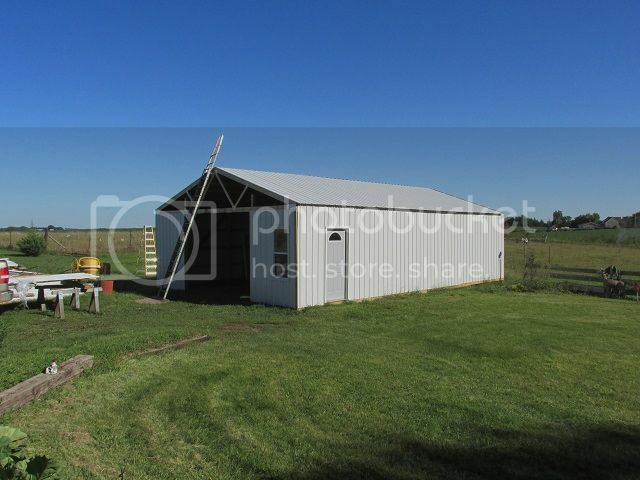 My plan is to build my garage similar to a pole barn. My poles will be spaced 12 feet apart for a total length of 36 feet. 24 of that will be garage, 12 feet will be a covered area between the garage and end of my house. I'll put 2x12s at the top of the outside poles, which means they can now support trusses. At this point I haven't decided if I'll use trusses or use rafters. For me the downside of rafters is another set of poles in the middle. But since I'll have the covered area one middle pole is near the house, two are inside walls, so only one is in the middle of the garage. Cost will probably determine if I'll go rafters or trusses. If it saves enough money I can live with the post in the middle. It will be spring before I start, but if you're not in a hurry I'll take pictures as I go along, which would make it much easier to understand. Have thoroughly enjoyed reading about your project! Please do keep posting. I've posted a little about this in the conversation section, but thought I should update things here too. Waited a lot longer then I wanted to build the barn, but I was having a hard time deciding where I wanted it. Kept going back and forth, and in the end decided to put it farther from the house instead of attached on the end of the house. Bad part was farther from the house just happened to be where I'd built the chicken house. But since the coyotes got all the chickens I figured why not just move the chicken house. We picked it up and set it back down in the corner of my back yard. 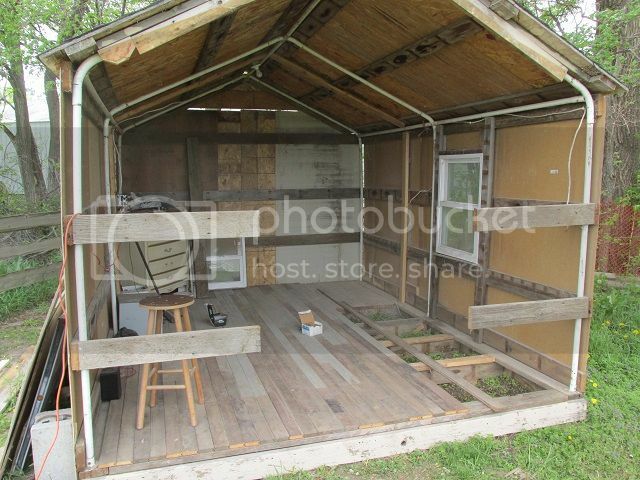 I gutted it, put in a new floor, changed the front door, and for the heck of it added a covered front deck. It's 10' by 13', thought it would make a nice place to do some of my taxidermy work. It would be easy to heat and even cool with a small window unit. Once that was out of the way work could start on the pole barn. I decided to go with 24' wide by 40' long. 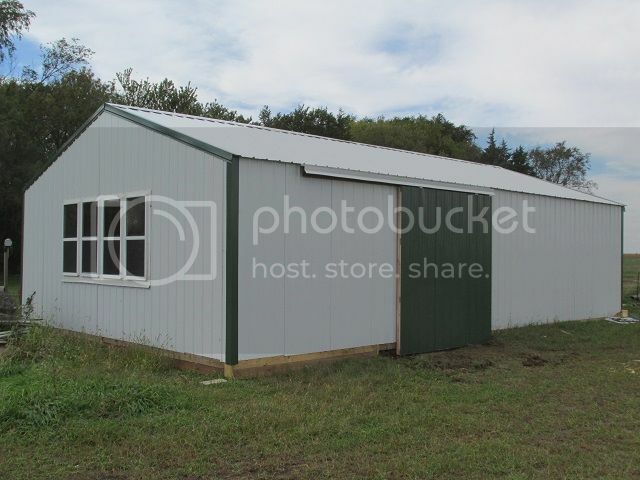 I'll put a 24' by 10' wide shop on the south side, which I can heat if I need to do work there in the winter. I put 4 windows that were left over from the house in the south wall of the barn to give me plenty of light and some solar heat in the winter. Started putting on some steel. Have to order more steel, which takes a couple weeks to get. Hoping to have it closed in somewhere around labor day. That is looking sharp Hunter. I don't know if I'd go as far as calling it a house of any sorts Annie. Though the granddaughters think it would make a good play house. When I first built the chicken house it was an odd build. A few years ago I bought one of those backyard tent type garages. Basically it's a metal frame covered with a plastic cover. The problem was it's way too windy around here and the wind got the cover. I kept the metal frame just in case I could use it later. That's where the chicken house comes in, lol. The metal frame was for a 10' by 20' enclosure, but some of the pipes bent when the wind got it. I was able to cut it down and end up with a 10' wide by 13' long frame. 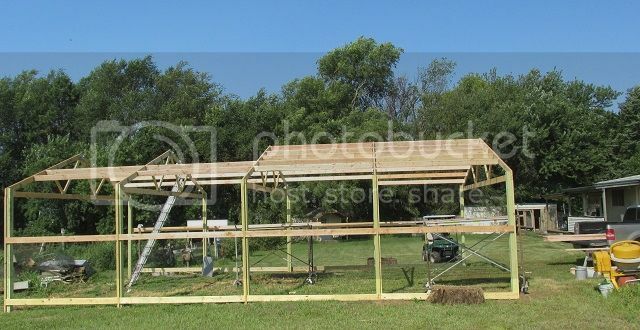 For my chicken house I sunk some 4x4" in the ground leaving them stick up about 6". Basically I put the 4x4s in the four corners. I then nailed 13' long 2x6s along the sides. 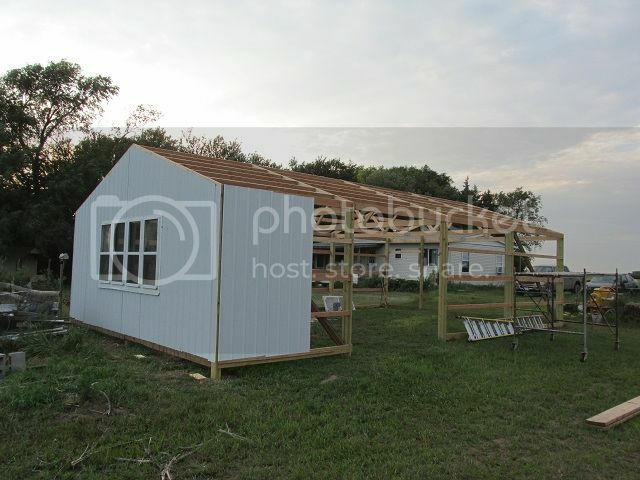 I also laid a 13' long 2x6 on top of the 4x4 and the first 2x6. This gave me an L shaped ledge with the 4x4s sunk in the ground holding it in place. With two of these 10' apart I was ready for my metal frame. I set it on the ledges and lag bolted them into place. I had a bunch of old cedar 2x6s that came off a deck, so I now attached these to the metal frame with screws. Putting them 24" on center up the side over the top and back down the other side. I now had wood to attach the wood siding and a way to attach ends. In the picture below you can see what it looked like from the inside. You can see the white metal frame and the 2x6s attached. 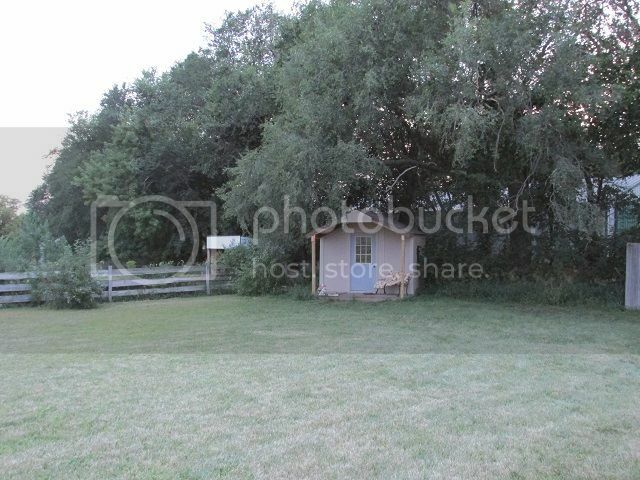 This picture was taken after it was moved to the back yard,the front was taken off, and I was putting in the new floor. When it was a chicken house it only had a floor on the back part and the front part was just dirt. Clearly this was not conventional construction, lol. This might even be a bit too much to be called redneck construction. Glad the building inspector didn't want to look at it when he came to look at my barn. He'd probably faint dead away if he saw the inside and knew how it was built. I will say when it came time to move it I was just hoping it wouldn't fall apart. But I was able to jack it up high enough to cut off the 4x4s with my chainsaw. Then it was just put it on a trailer and move it to the yard. It had one window but I added another to get some cross ventilation if I was working inside. I lined the inside walls with some blackjack a guy gave me. Thought that might help keep it warmer if I needed to heat it while working in there. Hunter thats called re-purposing huh? Those canvas/plastic tarps just dont make it here either. Re-purposing might be the polite way of saying it. When I moved it I still wasn't sure I was going to get my barn built this year, but knew it was going to have to be moved eventually. 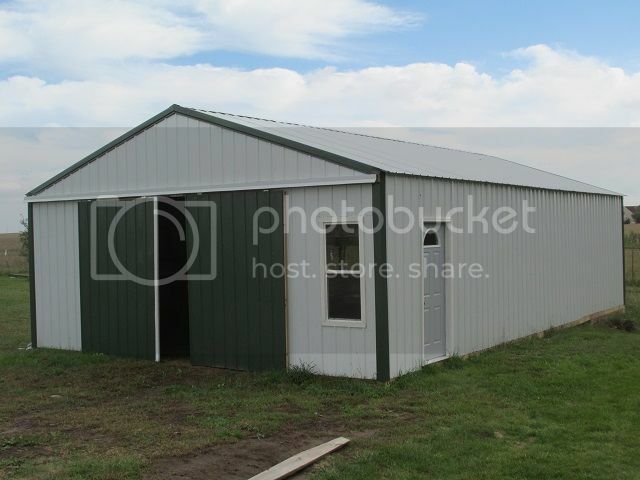 So the plan was make it better so I could use it until such time as the barn could be built. Then the June hail storm came along, and by doing the repair work on the house myself, I ended up with enough insurance money to start on the barn this summer instead of next spring. The nice part was I have very little into the building. The 2x6s for framing were given to me, and the metal frame was salvaged. The siding and OSB for the roof came from a home improvement store, but I got them from their bargain area out back. They throw together all different kinds of plywood, OSB, siding, paneling, and who knows what in a pile and band it together. Basically odds and ends that may be good or may be slightly damaged. I bought a pile of 40 or 50 sheets for $50. The shingles were left overs my contractor friend had. And the flooring you can see in the picture came from a house they were tearing down. Those boards are over 100 years old. A coat of paint on that old chicken house proves, beauty is only skin deep. The steel for the barn roof finally showed up. My son in law helped me put it on yesterday. I still need to cut two narrow pieces to finish off the last foot, but that I can handle myself today. After that I need the cap on top, the trim on the corners, and the doors. It's suppose to rain Tue and Wed, so I'd like to get the top cap on tomorrow. I should have made the barn 39' long instead of 40'. The top cap is $30 a section and they are 10' long. That means for overlap I'll need to buy 5 of them instead of only 4. 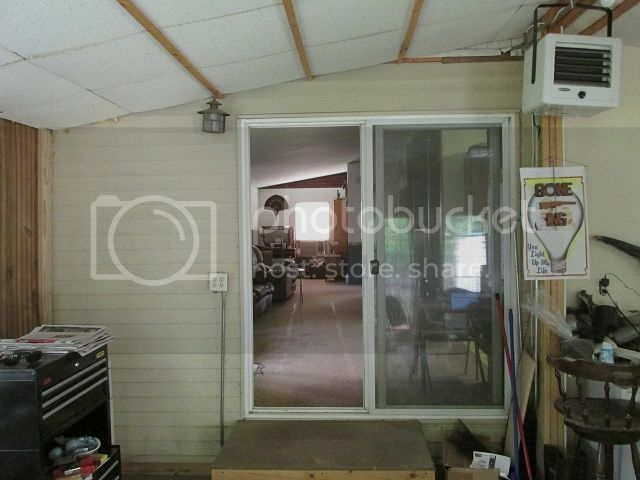 The 12 foot opening on the front with have two 6' sliding doors. I'm planning on dark green trim for the corners, so thought I might use dark green steel for the sliding doors. Very nice Hunter----I love to watch folks start and complete their projects. Well with the rain, got about 3", I had to take a bit of a break on the outside of the barn. Hope to get the doors on tomorrow. North wind is blowing and chilly, so I'd like to get the north doors on. Switched to inside work today. Been remodeling the sun room. Part of it still had siding showing since the sun room was added on later, and I wanted to replace the sliding glass door with interior French doors. Was able to get the doors hung today. Still need to finish the trim work, but at least hanging them was a big job done. Thank you. I am so much happier with the 5 foot opening rather then the sliding glass opening. It's been open for a few weeks now. I can tell when I have the AC on it does get cooler in the sun room, and the AC window unit it way at the other end of the house. Since the wood stove is right next to the French door opening, I'm hoping that means more warm air in the sun room come winter. I still need to make new stairs. When it was the sliding glass door the stairs were 4' wide, but now I want to make them 5' wide to go across the entire opening. I also want to reduce the width of the stairs to a standard size rather then the overly wide stairs I made the first time. Then then won't stick out in the room as far. Since then I've decided come spring I may add on to the run in shed I used for my calves. I can put my tractor, splitter, and firewood there. Might even be able to get the snowblower for the tractor in there too. 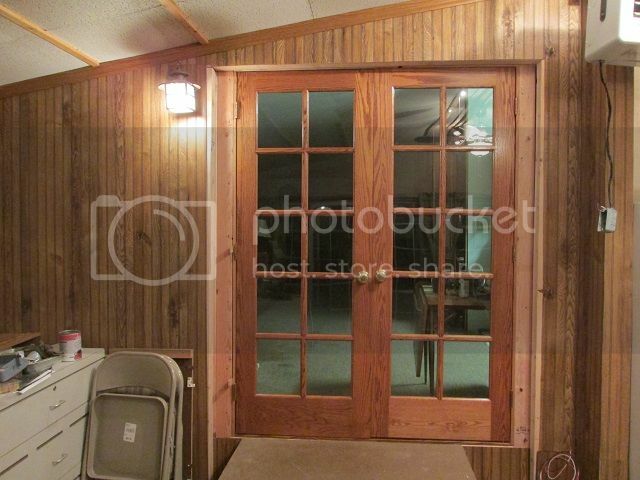 Anyway here's the pictures of the barn after I finished. A very interesting saga Hunter. You've got a real smart daughter there too. You should be real proud of her. Looks like you have done an excellent job on all the work you have done there Hunter. You have the right to be very proud of yourself with the projects you have accomplished....I started building rooms and garages when I was still a teenager and even thou my trade was basically a welder/fabricator and boiler maker, I have also contracted about all my life in between jobs and from what I see from all the pictures, you be hard to beat. A big congratulations to you.